Manoj Shyamalan (pron. : /??aem?l? ?n/); born 6 August 1970), known professionally as M. Night Shyamalan, is an Indian-American screenwriter, film director, and producer known for making movies with contemporary supernatural plots including The Sixth Sense (1999), Unbreakable (2000), Signs (2002), The Village (2004), The Happening (2008) and Devil (2010). He is also known for filming his movies (and… staging his plots) in and around Philadelphia, Pennsylvania, where he was raised. Most of Shyamalan's commercially successful films were co-produced by Walt Disney Studios' Touchstone and Hollywood film imprints. In 2008, Shyamalan was awarded the Padma Shri by the government of India. His most recent film is After Earth, which is a collaboration with Gary Whitta, and Will and Jaden Smith. This book is your ultimate resource for M. Night Shyamalan. Here you will find the most up-to-date information, photos, and much more. 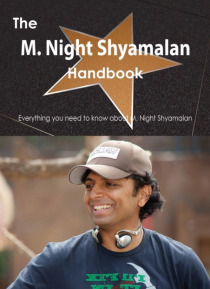 In easy to read chapters, with extensive references and links to get you to know all there is to know about M. Night Shyamalan's Early life, Career and Personal life right away. A quick look inside: M. Night Shyamalan, 10th Empire Awards, 2004 in film, 8th Empire Awards, Academy Award for Best Director, Academy Award for Best Writing (Original Screenplay), After Earth, Andrew Mondshein, Annie Award for Writing in a Feature Production, Avatar: The Last Airbender, Barry Mendel, Blinding Edge Pictures, Bram Stoker Award for Best Screenplay, Brian Nelson (screenwriter), Bruce Willis, Bryce Dallas Howard, Chicago Film Critics Association Award for Best Screenplay, Daniel Stamm, Danny Boyle, Devil (2010 film), Empire Award for Best Director, Episcopal Academy, Film director, Frank Marshall (film producer), Golden Raspberry Award for Worst Director, Golden Raspberry Award for Worst Picture, Golden Raspberry Award for Worst Prequel, Remake, Rip-off or Sequel, Golden Raspberry Award for Worst Screenplay, Golden Raspberry Award for Worst Supporting Actor, Greg Brooker, Hollywood Pictures, Indiana Jones and the Kingdom of the Crystal Skull, James Newton Howard, John Erick Dowdleand more pages!Contains selected content from the highest rated entries, typeset, printed and shipped, combining the advantages of up-to-date and in-depth knowledge with the convenience of printed books. A portion of the proceeds of each book will be donated to the Wikimedia Foundation to support their mission.